This Deep Dish Pecan Pie is a gloriously gooey pie, packed with toasted pecans and chunks of chocolate. For serious pie lovers only! I know we’re a bit past traditional pecan pie season now, but for my family, this Deep Dish Pecan Pie isn’t seasonal–it’s a year-round favorite. In fact, my husband Jason loves it so much, he usually requests it for his birthday, in lieu of cake. Anyhow–his birthday was this week, so of course pecan pie is on the menu. 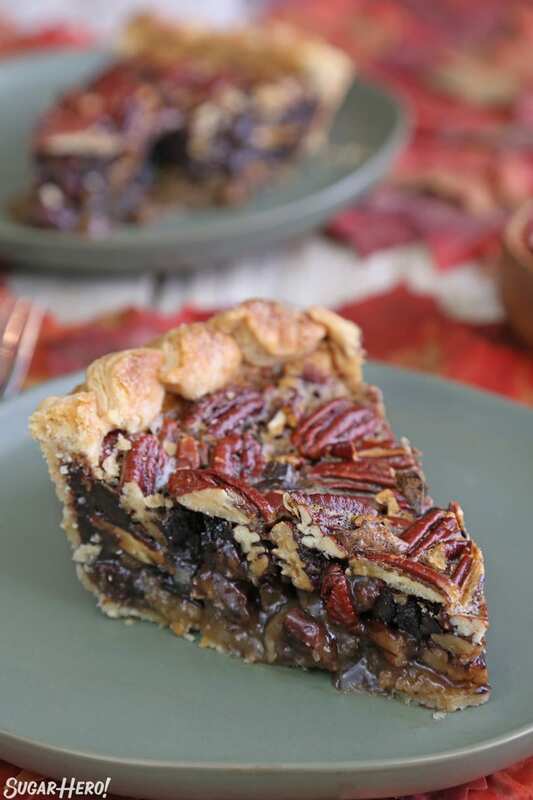 I realized it’s been years since I’ve shared our favorite pecan pie recipe on SugarHero, and since this is a fabulous dessert for a holiday crowd, it seemed like the perfect opportunity to bring it back! 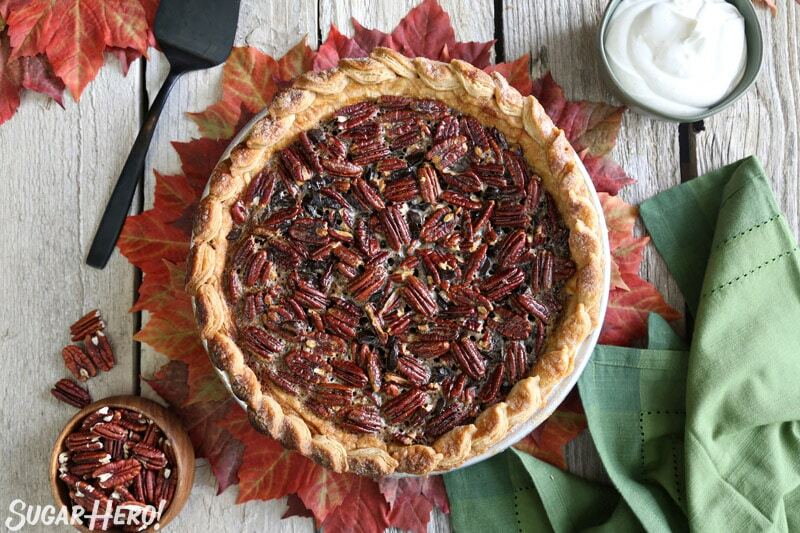 This pie isn’t too different from most pecan pie recipes. If I had to sum up the differences, I would say, simply: MORE. It has more pecans, more filling, and more flavor, from a hefty dose of cinnamon and lots of delicious chocolate chunks. 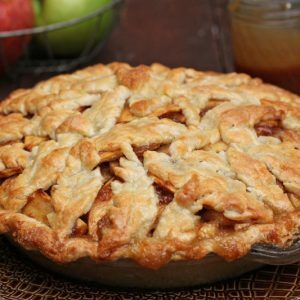 It’s the Big Daddy of pies, and if you’re looking for a dessert to feed a big group, look no further. 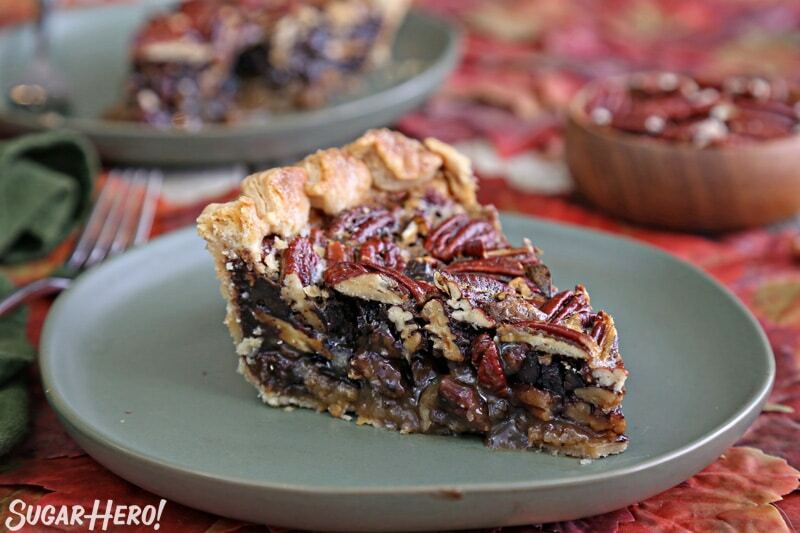 Par-Bake the Crust: this is personal preference, but I can’t stand a soft, floppy pie crust underneath my pecan pie. So I first blind-bake the crust (by lining it with foil and then filling with beans and baking), and then I bake it a little longer once the beans are removed. It’s not fully baked, but this gives the crust a “head start” and ensures a fully baked, firm bottom crust at the end. 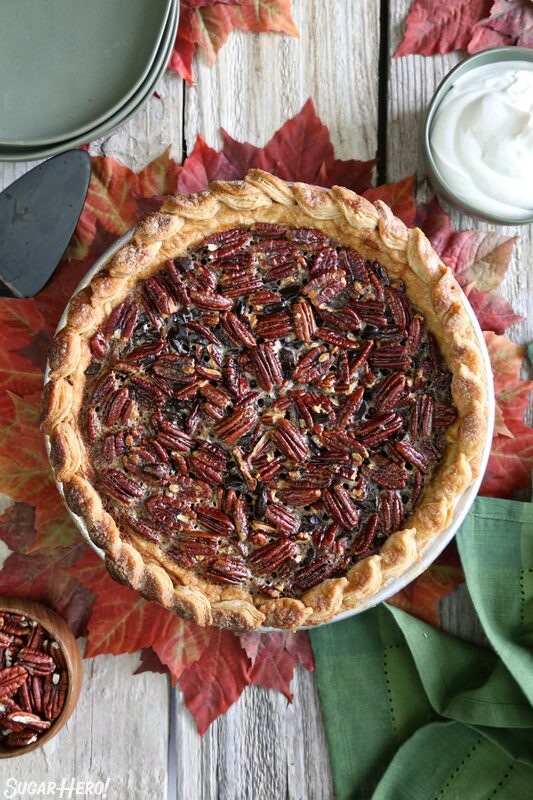 Do the Outer Crust in 2 stages: I like to add a decorative leaf border to my pecan pie, but I always add the leaves AFTER par-baking the crust. This way, the border bakes alongside the filling and doesn’t get burned to a crisp. You should still monitor the crust and cover it with foil if necessary to make sure it doesn’t burn, but adding the decorations after par-baking goes a long way toward getting that perfect finish. Toast Your Pecans! There’s nothing sadder than bland pecans in a pecan pie. 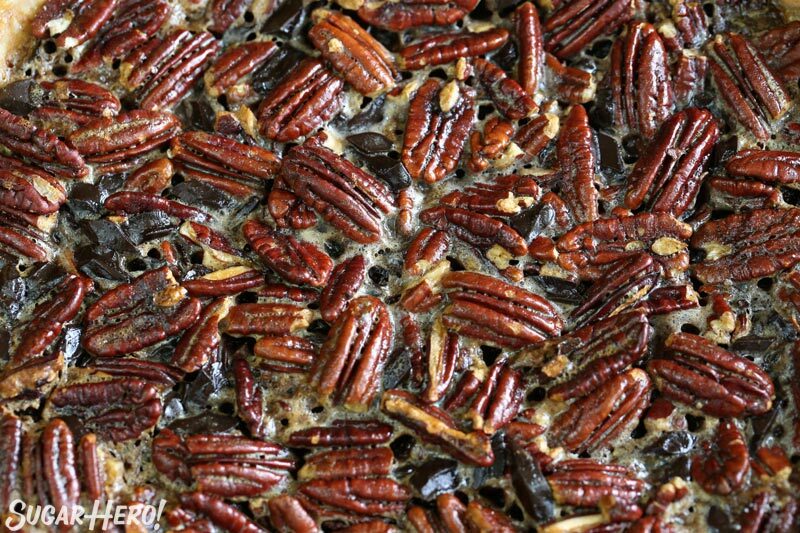 Before you make the filling, toast the pecans in a 350 F oven until dark brown and fragrant. 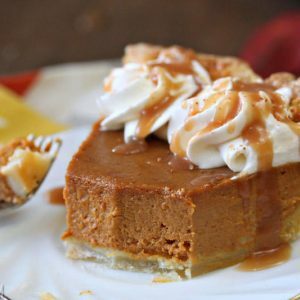 This brings out their natural flavor and makes your pie much better. Add flavor whenever possible. Pecan pie has the tendency to be really sweet, so I’m always trying to balance the sugar with more flavoring. Use dark brown sugar instead of light if you can. Add cinnamon, and do NOT skimp on the salt! And finally, a glug of bourbon or your liquor of choice is always welcome. If you couldn’t tell from the pictures and video, this pie is massive. Not only is it deep-dish, but it’s baked in an 11″ pie tin, instead of the standard 9″ size. Like I said, it’s great for a big crowd or party! I bought my 11″ pie pan at Smart & Final, but you can find disposable 11″ deep dish pans online. You can also use a cake pan or deep tart pan if that’s what you have available. 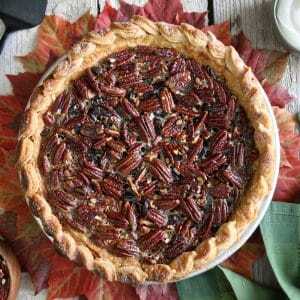 The other option is to either halve the recipe to make one standard 9″ pie, or make two 9″ pecan pies from this one recipe, adjusting the cooking time down to account for the shallower pies. If you make two pies, know that you can easily freeze pecan pie by letting it cool completely, then wrapping it tightly and placing it in a freezer bag. Let it defrost in the refrigerator, then reheat (if desired) and serve! This pie is crunchy, gooey, nutty, and chocolatey, with a deep brown sugar flavor and a buttery, flakey crust. I’m not saying you have to make it for your next party or birthday, but I am saying that you won’t be sorry if you do! This Deep Dish Pecan Pie is a gloriously gooey pie, packed with toasted pecans and chunks of chocolate. For serious pie lovers only! 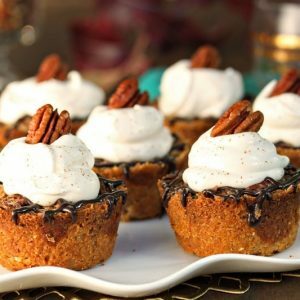 We love this with big chunks of chocolate, but you can also omit them for a more classic pecan pie. This recipe makes a LARGE pie, so please see the Note below for how to make a smaller version! Combine the flour, sugar, and salt in the bowl of a food processor (10 cups or larger size) and pulse a few times to combine. Add the cold cubed butter and shortening, and pulse in short bursts until it’s cut into the dry ingredients and the mixture has the texture of coarse crumbs. Add half of the ice water and pulse in 5-second bursts, adding the rest a little more at a time just until the dough starts to come together. You may not need to use all of the water—stop when the dough starts to come together, and don’t overwork it! Turn the dough out onto a lightly floured board and knead it just enough to incorporate any dry patches of flour. Shape it into a disc, wrap it well in plastic wrap and refrigerate it an hour to let it rest and chill. After an hour, roll the dough out on a lightly floured surface until about 1/4-inch thick. Lay it in a deep dish 11” pie pan, and trim the excess from the sides. Prick the bottom of the crust with fork tines, and put the pie in the freezer to chill for 15 minutes while you preheat the oven to 350 degrees F.
Once the oven’s ready and the dough is chilled, spray a piece of foil with nonstick spray and press it, sprayed side down, on top of the pie dough. Fill the pie shell with beans or rice, then bake it for 20 minutes until the sides of the crust look set and start taking on some color. Carefully remove the foil and beans, then continue to bake the crust for an additional 15 minutes, until it is no longer raw in the center and is starting to color. If you’d like, you can roll out the excess dough and cut small shapes out of it—I like using ovals or leaf cutters. Once the crust is baked and cooled, brush the rim with beaten egg, and place the crust cut-outs around the edge. Brush the top of the cut-outs with more beaten egg, and sprinkle it with a little sugar. Fill the crust and bake as described below. This method of decoration takes a little more time, but it looks wonderful and it prevents the edges of the crust from getting overdone since the edges are baked along with the filling and are not pre-baked like the rest of the crust. Preheat the oven to 375 F. In a large bowl, whisk together the corn syrup and brown sugar until smooth and free of lumps. Add the melted butter, then the eggs one at a time. Finally, add the vanilla extract, cinnamon, and salt, and whisk until smooth. Put the pecans and chopped chocolate in the cooled pie crust, then pour the filling mixture on top. Tap the pie pan against the counter several times to pop any air bubbles. Place the pie on a baking sheet covered with parchment, to keep your oven from getting messy in the event of any spills. Bake the pie at 375 F for 20 minutes, then turn the oven down to 350 F. Bake for an additional 55-65 minutes, until the pie is puffed, there are a few cracks along the sides, and the center doesn’t jiggle like gelatin when the pie is tapped. If the outer edges of the crust appear to be getting too dark during the cooking process, cover the edges loosely with foil strips. Once baked, remove the pie from the oven and cool at room temperature. It’s wonderful—but messy!—when eaten warm, and it’s also delicious at room temperature or even chilled. Serve with whipped cream or ice cream, and refrigerate leftovers for up to a week. This recipe makes one large 11" deep dish pie. If you have a regular 9” pie shell, you can cut both the crust and the filling recipe in half, OR make two 9" pies! The baking times will have to be reduced, so watch the pie carefully as it bakes. I’m totally with Jason on this one, I have to say! I love birthday cake, but when it comes down to cake v. pie, it’s pie all the way. Thanks Johlene! I have to say, the gooey, melty texture of pecan pie is one of the things I DO like about them–it just goes so well with melty ice cream! I can totally see why anyone would want this pie on their birthday. Yum! 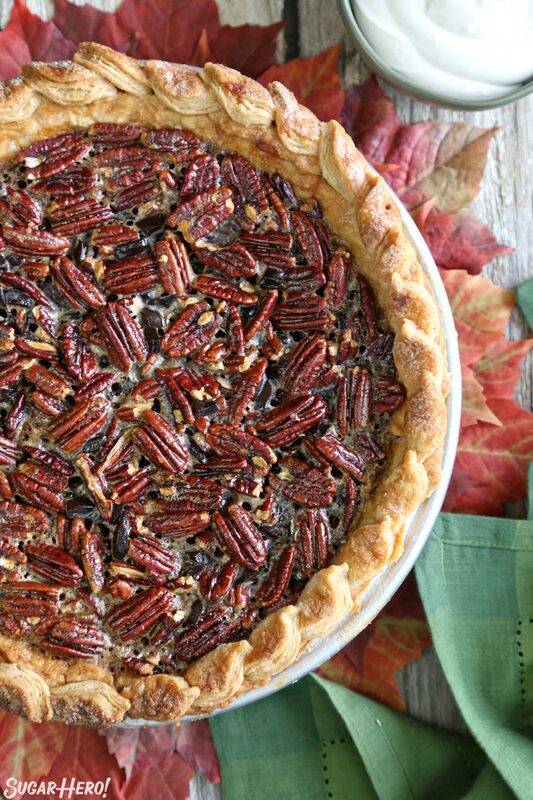 Plus pecans are so expensive, but this pie looks totally worth it! You are right–pecans are crazy expensive! That’s why we have to make every pecan dessert count. 🙂 Thanks for stopping by, Faye! I have never in me entire life tasted pecan pie. I don’t know what’s wrong with me because this looks amazing! Ari, what?! You have to try it! Even though it’s not my favorite, it’s such a classic, it’s worth a taste sometime! Happy birthday to the Mr. SugarHero! I’m with him, though–birthday cake is great when it’s good, but pie is ALWAYS good. This looks especially fantastic, and I love the chocolate addition (you WOULD). Thanks D! And I hope that “Chocolate–you WOULD” is sometime written on my tombstone. Seems like a good life motto to me! I have got to make that pie. Putting it on my menu for Christmas. Thanks Damaris! Please let me know how it goes if you give it a try! 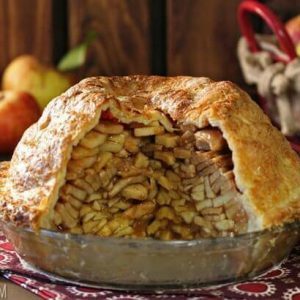 I need to make this – it looks like the best pie ever!! Thanks Ashley! No joke, my husband waits aaallll year just to devour this on his birthday! It’s hard to go wrong with warm pecan pie and cold ice cream! Okay, so I don’t really love pecan pie, but I do like pecan bars, and if you add chocolate? I’m sold! I’d love to see your recipe–you should post it on the blog! I’m learning that birthday pie is a totally common thing! 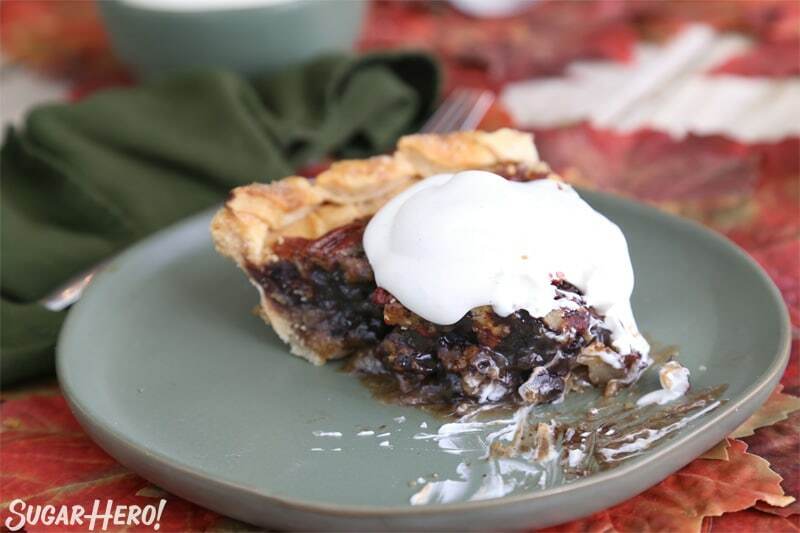 So fun that you did a pie round-up–I’ll bet you have some awesome recipes on your blog! As much as I love cake, I would not turn this down on my birthday. I want to buy a deep dish pie pan just so I can make this! Thanks Natasha! I’m with you–I prefer cake, but I wouldn’t kick pie out of my kitchen! And I have to say, deep-dish is toooootally the way to enjoy this pie! More to love! I actually made your recipe for my boyfriend who also isn’t a huge cake fan. Neither am I honestly. I made it twice actually, once for my family and once for my boyfriends birthday and both times it came out so good that it’s become a favorite. Amazing recipe! Oh Tali, I’m so glad to hear that! It’s definitely the perfect birthday pie. 🙂 Thank you for the sweet comment! Elizabeth–I’m trying this recipe for the first time. Do you leave all of the pecans halves whole? In the photos, it looks like the pecans below the surface are chopped. Appreciate your help! Hi Gisele, I typically leave the pecans whole (although you could also use chopped pecans if that’s what you have on hand.) My guess is that the picture looks that way because the pecans were cut in half during the process of cutting the pie slices. Basically I just toss whatever nuts I have into the pie and it always works out. 🙂 Enjoy! Wow that looks amazing! I like your husband 🙂 while I enjoy birthday cakes, Pecan Pie is my most favorite dessert. As a always hungry boy, I like my pies deep like this. I’m worried if I try to make this then I will eat nothing else, but the pie. I’m confused by your measurements. 17 oz does not equal 1.5 cups, It would be 2 1/4 cups, as there are only 8 ounces in a cup. Are you going by weight? Did you use 17 ounces of corn syrup or 1.5 cups? Hi James, Yes, the corn syrup is measured by weight. I think the confusion is coming because you are thinking of liquid ounces but I always indicate liquid ounce by writing fl oz and regular ounces as oz. If you have a kitchen scale measure out 17 ounces otherwise measure 1.5 cups. Please check your measurement for the Karo: 17 oz is just over 2 cups, a whole bottle of the stuff plus some more. Without a correction, I’m afraid this recipe is a waste of everyone’s time, and I really was looking forward to making it. I hope you give it a try, it’s one of my family’s favorite recipes! We’re making it for Thanksgiving again this year.